Over the past few months I've been taking a lot better care of my brows. I used to have quite sparse brows and didn't really know much about plucking, shaping and filling them in but since growing them out I look after them a lot better! To grow them out I use Castor Oil which I bought from Amazon, this stimulates hair growth so if you have sparse brows that don't grow, I would recommend trying it! I naturally have honey blonde hair, my brows are quite dark in comparison to my hair colour but still quite fair. 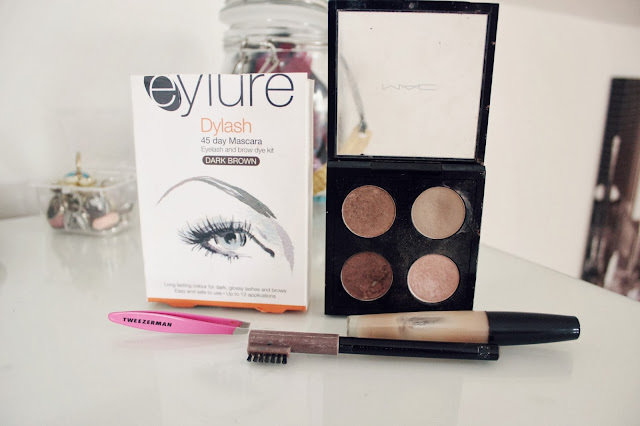 I dye them with the Eylure Dylash 45 Day Mascara, I don't do this too often however I would recommend it as it works quickly and is super easy to use. To fill my brows in, I start with Omega eyeshadow by Mac with just a simple angled brush, this eyeshadow works great on blonde brows as it isn't too dark, too ashy or too red toned. Then for a more precise brow I use the Rimmel Eyebrow pencil, this is great for a defined brow and as well as the eyeshadow, the shade is a great match for my brows. I then brush my brows through with a clear mascara (any will do!) which makes my eyebrows stay in place as they often like to do their own thing! I pluck any stray hairs with the Mini Tweezerman Tweezers, these are the best for getting even the shortest hair. They are better than any other tweezers I have tried, they are slightly pricier but 100% worth it! Do you have any brow recommendations? I always use a brow powder. Lately ive been using Brow Zings from benefit, i love it!